No longer is DR a process too complex to implement and too expensive to afford. DR today is a realistic and achievable solution with manageable costs. With Microsoft Azure, IT can now implement relatively easily compared with what it was a few years ago a DR solution to restore IT capabilities at the same facility or across physical sites in a DR scenario. 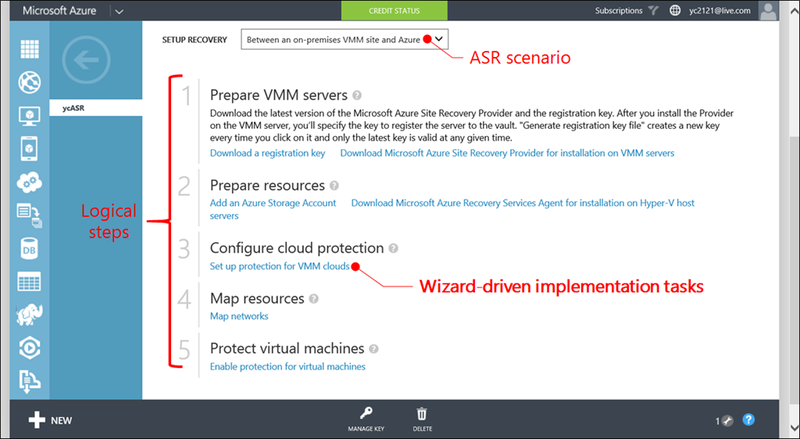 Azure Site Recovery, or ASR, is a Microsoft solution to protect applications in DR scenarios by automating, monitoring and orchestrating the replication, failover and recovery of physical and virtual machines relevant to both Microsoft and VMware environments. As of February, 2015, there are five targeted ASR scenarios as listed below. Home page, pricing, documentation, etc. And each is with prescriptive guidance to step through the processes for building an associated DR solution. 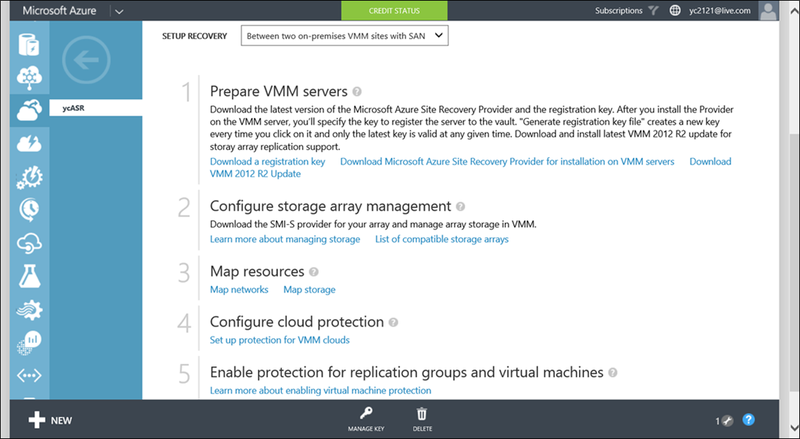 A replication coordinated by ASR can be directed to another on-premises datacenter, Azure or a hosting service provider without facing the financial commitment and implementing the technical complexities of building and managing a company-owned secondary location. The simplicity, automation, customizable recovery plans, health monitoring and orchestrated recovery and supported SLAs makes ASR a reliable DR solution that is readily available for businesses of all sizes. To facilitate IT pros to assess ASR as a DR solution, this article highlights the following essentials. Microsoft Azure is a subscription-based public cloud offering and requires an active subscription to access her services. 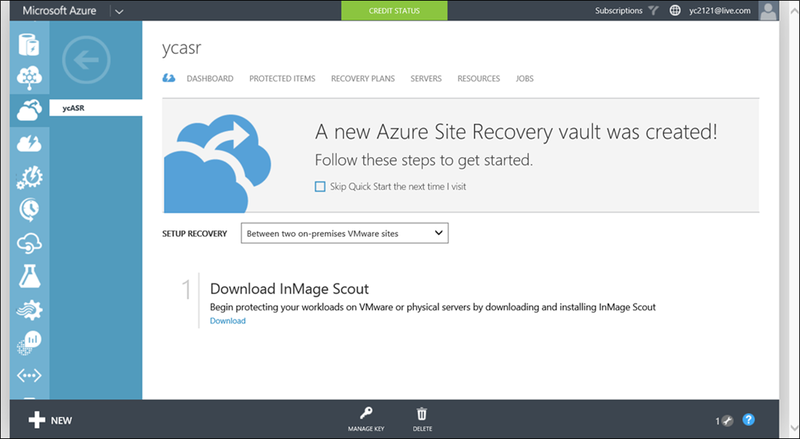 A free 30-day trial of an Azure subscription with $200 credit for deploying Azure services is available at http://aka.ms/Azure200. 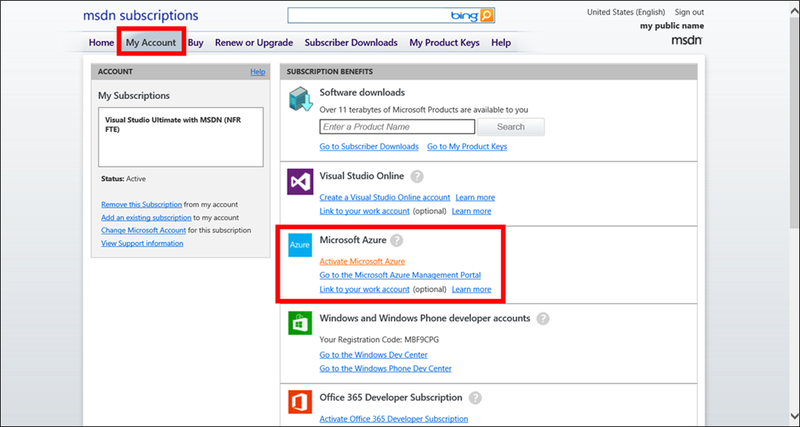 For those who are active MSDN subscribers, an associated Azure subscription is already put in place. 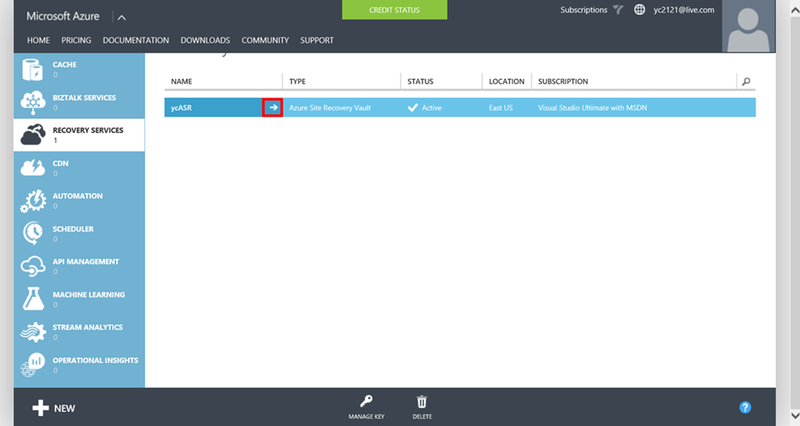 However, a subscriber first needs to activate the associated Azure subscription from the Account page once authenticated into MSDN subscriber web site at http://msdn.microsoft.com. 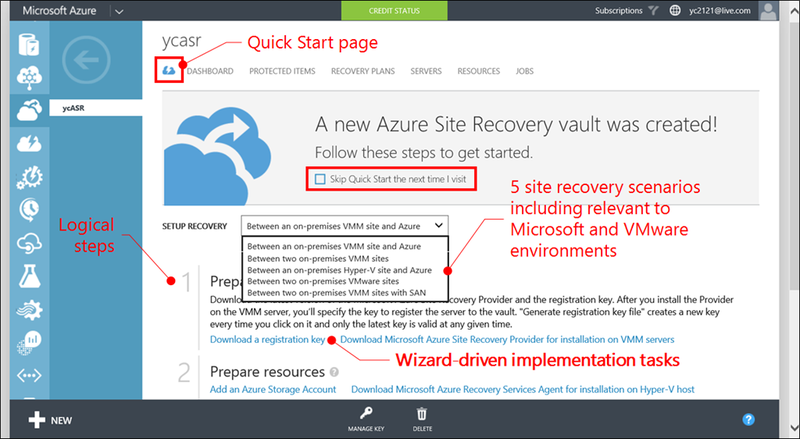 Upon authenticated into Azure Management Portal, http://manage.windowsazure.com, either scroll down on the left navigation pane then click +NEW or simply click +NEW in the lower left corner of the black menu bar at the bottom to create a Recovery Vault. A name and a region are the required two pieces of information. 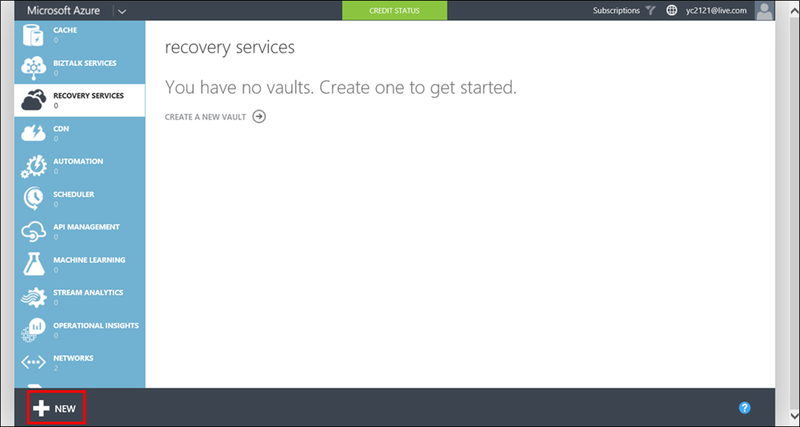 And upon creating a Recovery Vault, a Quick Start should appear. 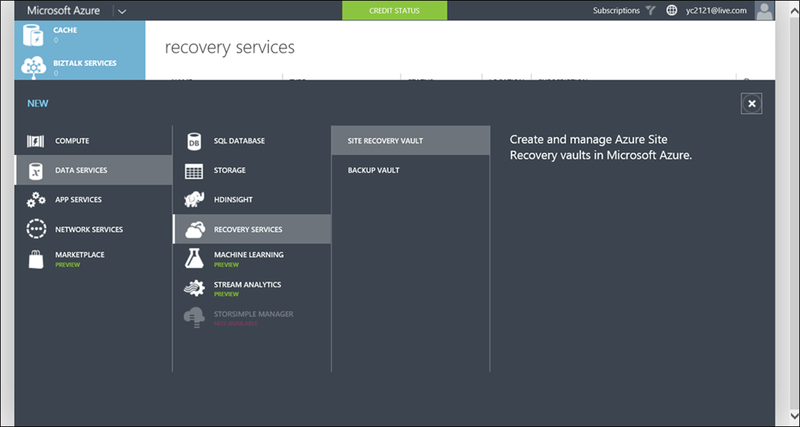 However if the Quick Start page does not automatically display itself instead it shows the name list, as shown in the last screen capture, click the arrow next to the vault name to bring up the dashboard. And as needed, click the little-blue-cloud-with-a-lightening icon which is the first one and next to DASHBOARD to bring up the Quick Start page, as illustrated below. 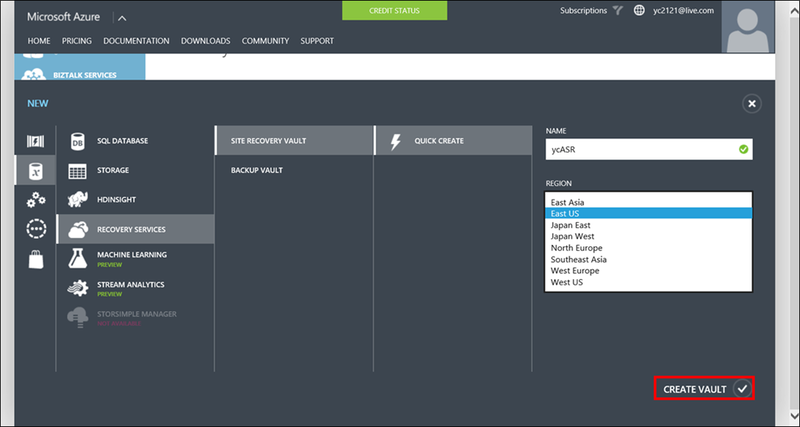 There is a Quick Start page on most, if not all, Azure services. This is an important reference with official guidance to implement/configure an associated service. The Quick Start page is readily available by clicking the indicated icon i.e. the associated page tab. 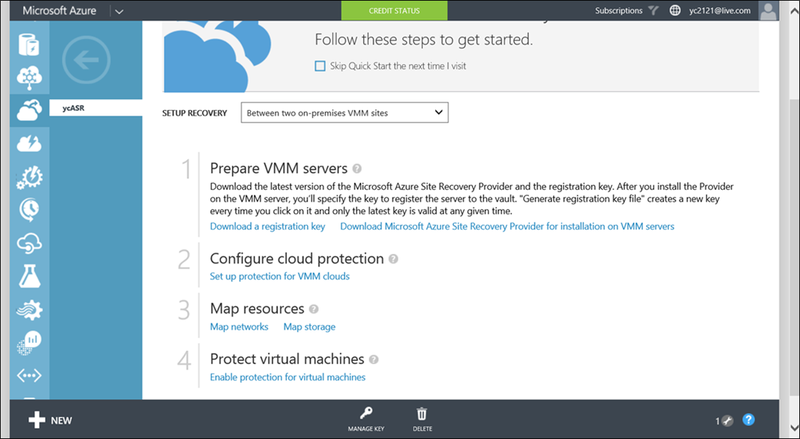 Notice on the Quick Start page, there are 5 site recovery scenarios available as shown above. To employ ASR as a DR solution, one should first get familiar with these scenarios and their associated processes and tasks. One direct and quick way to master ASR is to create various recovery vaults and follow the guidance of each scenario to experiment and assess the automation, replication and failover relevant to particular business requirements. Here I am including the Quick Start page of each of the five scenarios. Over the years, DR has remained a critical part in protecting business facing unplanned events overwhelming an entire business application or an IT facility. What has dramatically changed is the availability, readiness and affordability of a DR solution by employing cloud computing as an integral part. Businesses in all sizes can now implement a DR solution that is not only technically feasible and verifiable, but financially affordable and manageable as a subscribed service like ASR. While recognizing this opportunity and the availability, reliability and readiness of a DR infrastructure is not longer an issue, IT now must validate business plans, develop ASR DR solutions and incorporate the ASR processes and operations into standard operating procedures. On a regular basis, simulate failovers to DR sites based on business scenarios to ensure DR readiness. The good news is that Azure has done the heavy lifting by providing a DR infrastructure in cloud with on-demand accessibility and availability and wizard-driven processes to implement DR solutions based on business requirements. What IT must do now is to translate business DR requirements into configurations and processes by following what is presented in the ASR Quick Start page.